Five-year-olds are creative and enthusiastic problem solvers. They offer progressively more imaginative ideas for how to do a task, make something or solve longer-term or more abstract challenges. As they participate in a variety of new experiences, five-year-olds ask more analytical questions than younger students and weigh their choices.They are also more social as they learn new things and prefer activities that involve other children. Children this age enjoy initiating conversations. They also can discuss stories and are able to tell their own tales (and tales they do tell!). Five-year-olds abound with energy and seek active games and environments. They want to know more about how the world works. Hands-on experiences help them to form theories to explain "how" and "why" things happen. Children this age can manage feelings and social situations with greater independence. Being accepted by "the group" is becoming more and more important. 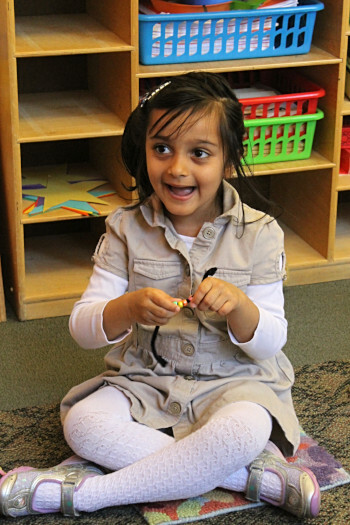 The dramatic play of five-year-olds is pre-planned, elaborate and sustained. And... did we say DRAMATIC! The goal of the kindergarten program is to provide experiences in making choices, solving problems, navigating social activities, collaboration, exploring artistic creativity and developing literacy skills. Independence is encouraged and respect within the group is stressed. The four language arts strands are emphasized (literacy, letter/sound relationships, communication and writing). Children have opportunities to explore and use mathematical concepts, as well as different science and social studies themes that stem from teacher or student ideas. Hands-on materials are used liberally and each theme is integrated into the day through literature, art or math. Units of study often involve the natural world, including investigation of the school's 43 acre campus. Social studies learning includes geography, civics, economics and social awareness. Students also learn about who we are, the ways in which we are the same and the things that make us unique. The goal in science and social studies is to introduce kindergarten students to ideas they will study again in subsequent years.